Benjamin Cayetano: First highest-ranking elected official of Filipino ancestry in the State of Hawai‘i: 2nd in a series. Benjamin Cayetano with Earl Anzai. It still surprises some that Ben Cayetano served eight years as Lt. Governor. None of his predecessors had done so. One, William Richardson, became a revered Chief Justice of the Supreme Court (and later a Bishop Estate Trustee). Two, Tom Gill and Jean King, ran against incumbent Governors in Democratic primaries and lost. One resigned. The last Republican to serve as Lt. Gov., Duke Aiona, lost in the General Election. But two, George Ariyoshi and John Waihe‘e, served in the final terms of the incumbent Governor and succeeded to the office. As someone once described the U.S. Vice-President, the only constitutional duty is to keep breathing. The Lt. Gov. job, at the time, was primarily concerned with running elections every two years and some minor functions usually left to secretaries of state. Ben did propose and make some changes to ease voter registration laws (Wikiwiki voter registration) but with most business registration operations assigned to the Department of Commerce and Consumer Affairs, the Lt. Gov. was at the mercy of the Governor for meaningful assignments in non-election years. In 1986, Gov. Waihe‘e brought in the first major change of administrations from what was viewed as the old guard of the Democratic Party. 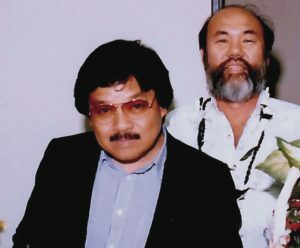 Over the course of the first quarter century of statehood, many government officials served first Jack Burns and then his handpicked successor George Ariyoshi. As a result, Waihe‘e swept into office his own young, loyal and energetic team to lead his host of initiatives and new programs. These included a young doctor from Maui named Jack Lewin to head the Health Department and Harold Matsumoto and Norma Wong at the Office of State Planning, Mario Ramil and Robin Campaniano at the Department of Labor and Insurance Division, and Warren Price as Attorney General. A Lt. Gov. was good to have as a back up but Gov. Waihe‘e had his own team and as would be expected, they wanted to run their own agencies and programs without interference from a fifth floor upstart. After all, Ben had not been projected as the ideal running mate for the charismatic young Hawaiian John Waihe‘e. The local political pundits thought former Honolulu Mayor Eileen Anderson would have made a better pairing—balancing the ticket against the Republicans who had not seen the inside of Washington Place since 1960. Ben did have a moment in the news when he chaired and organized the task force on educational governance, working with his old Senate colleague Charles Toguchi who was then serving as Superintendent of Schools. But most of the report’s recommendations required either legislation or administrative changes at the Department of Education. While Ben had a close ally in Superintendent Toguchi, reform moved slowly even in areas where there was consensus about a need for change. The notion of giving the Governor or Board of Education more direct authority, especially with regard to funding and to clarify responsibility for education was as controversial then as now. The accountability report certainly didn’t recommend changing the elected Board of Education to an appointed one which would have made the elected Governor more directly responsible for educational results. More satisfying had been an effort to create an after-school program using existing public classroom facilities. The Lt. Gov. 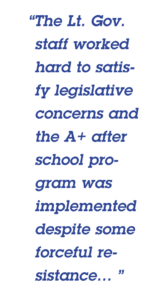 staff worked hard to satisfy legislative concerns and the A+ after school program was implemented despite some forceful resistance from some quarters in the Department of Education. Regardless, A+ became something that Ben considered an important program given his own childhood experience as a latchkey kid. It was also successful enough to give credit to everyone who supported the idea, including various county officials. But Ben remained outside the mainstream of the Democratic party hierarchy and the Waihe‘e Administration. Ben, it was rumored, was offered the possibility of judicial appointments or encouraged to seek other offices. With some history of Lt. Govs. challenging Governors, the relationship between Gov. Waihe‘e and Ben was not perceived as particularly warm. In 1986, Ben had been touted as the perfect running mate for the favored Cec Heftel and there had been some notion that Ben’s folk were, at heart, Heftel folk. Cayetano and Waihe‘e laugh during a Filipino Chamber of Commerce of Hawiai event. John Waihe‘e, it was thought, also had a different temperament than the publicly more reticent Ben Cayetano. John always appeared to enjoy the social aspects of politics—the meet and greets and the photo opportunities. Ben actually had a shyness in crowds and would search out people he recognized. In the late 1980s, I was busy learning to be a lawyer and only rarely came into contact with Ben or his campaign people. 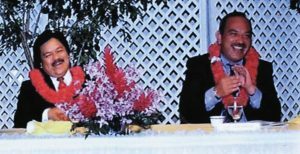 In 1990, Ben eventually announced plans for re-election and ran unopposed to serve as John Waihe‘e’s running mate. Two obscure young attorneys served as co-chairs of that campaign. L&#257;na‘i-native Colbert Matsumoto worked at the influential Fujiyama Duffy Fujiyama law firm. Educated in the Bay Area, Colbert was developing a reputation as a thoughtful and principled lawyer with an interest in civil liberties issues involving the Asian American community. He had also served on the Ways and Means staff of then-Senator Cayetano. Government attorney Wilfredo Tungol and Cayetano. Government attorney Wilfredo Tungol had intended to lay low but couldn’t refuse the request to lend his name to the campaign. Even in 1990, the number of Filipino-American lawyers remained small and Will was among the growing number that followed pioneers like Peter Aduja, Benjamin Menor and Bernaldo Bicoy into the profession. He had also served the growing Filipino Chamber of Commerce on its Board and would serve as President in 1991. As a Pearl City resident, Will was also a long-time Ben constituent and supporter. While media increasingly dominates a campaign, most supporters contact with a campaign is with the old-fashioned work in the political trenches—folding letters, making phone calls, sign waving. Lloyd’s role was usually to bring some coherence to the chaos of a statewide campaign without draining too much money from paid media. He basically had to direct the energies of the many volunteers into the various useful but often numbingly tedious tasks when many of those volunteers would have preferred to design a media spot or write a stump speech. Without another battle between sitting Governor and Lt. Gov., the biggest race turned out to be unexpected. Democratic U.S. Senator Spark Matsunaga died and Gov. Waihe‘e appointed Congressman Daniel Akaka to fill the seat until a special election. GOP Congresswoman Pat Saiki, who had won her seat in 1986 by defeating Mufi Hanneman, also announced for the seat and held a commanding lead in the polls. That scenario resulted in both Congressional seats being open. 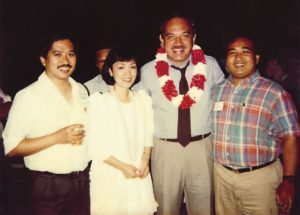 Honolulu City Councilmember Neil Abercrombie announced for the urban Honolulu seat that he had held briefly in the Fall of 1986. 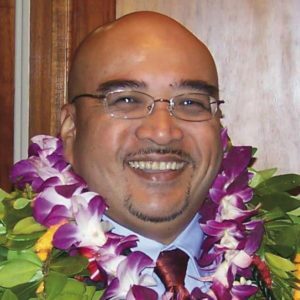 State Senator Norman Mizoguchi, mentioned as a possible gubernatorial candidate and a favorite of the public worker unions, also entered the Democratic Primary. Local attorney Matt Matsunaga, the youngest son of Sparky, had been interested in the interim appointment. He decided to run for the House seat vacated by Rep. Saiki. In the rural O‘ahu/Neighbor Island race, State Senator Ron Menor entered, along with Councilmember Patsy Mink, C. Brewer executive Mufi Hanneman, and state Senator Mike Crozier. Without a primary race, Cayetano partisans went to work on the various campaigns. Fred Evangelista supported voter registration efforts for Ron. I took the summer off from legal practice to campaign for Matt who worked at the same law firm as me. Earl Anzai and others toiled on Neil Abercrombie’s back to congress effort. With the more experienced and savvy political operatives gravitating to Neil or Norman, the Matsunaga campaign was summer camp by amateurs. There were a lot of young lawyers who were contemporaries of Matt or his wife as well as young people and their friends who had interned for Sparky in Washington, D.C. While a number of Senator Matsunaga’s 100th Battalion colleagues were sympathetic, much of the work was undertaken by twenty-something year olds who never quite grasped the essential notion that we couldn’t win. Both of Matt’s opponents expected that our performance could tip the balance between Neil and Norman. 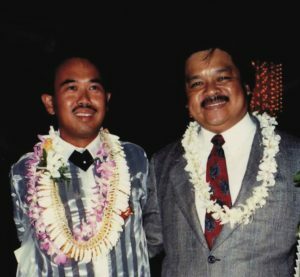 Alfredo Evangelista, left, and Gil Keith-Agaran, right, at a coffee hour for the Waihe‘e-Cayetano team in 1990. As a result, we learned from scratch the basics of grassroots campaigning—silk-screening t-shirts and signs by hand, picking sign waving spots, prepping and cooking for large breakfast gatherings from M&#257;noa to Aiea, feeding volunteers, preparing the candidate for coffee hours and trying to answer every questionnaire from every group that offered an endorsement. Some of us even tried to write television commercials. Mistakes happened. One week, we were sending out friend-to-friend cards using voter registration lists. A new volunteer came in day after day and seemed to be doing a bang-up job. Unfortunately, he was simply filling out cards for everyone on the list he was reading and not just to people he knew. I would spend some time each day at Cayetano headquarters to shoot the breeze with Lloyd who had been through large campaigns in the past. Often, other Cayetano folk would be there seeking a break from the more active campaigns. A few weeks before the primary, a media poll indicated that Matt couldn’t win but he was getting enough support in the three-way race to tip the scales. Energized by a rather engaging performance in a debate, we know-nothing kids campaigned hard in the final weeks, including our media buys. As a result, Matt made a respectable showing for a newcomer. In the minds of some supporters of Mizoguchi and party regulars, Matt took votes that should have or would have gone to the other AJA in the race. In the other House race, Patsy Mink won the nomination by beating back Hanneman, Menor, and Crozier. Gilbert S.C. Keith-Agaran served for eight years in the Cayetano administration in various appointed positions. He practices law in Wailuku, Hawai‘i. At some point, Lloyd asked Fred and me to start attending some meetings with the Filipinos for Waihe‘e committee. We were frankly envious of the Waihe‘e re-election machine. It appeared to have enough money to fund both media and a significant grassroots effort and could call on every part of the party constituency. In addition, the campaign was run by the legendary Bob Oshiro. Every campaign had sub-groups aimed at gathering support from various constituencies. With most financial resources in any campaign increasingly dedicated to paid media, especially television, budgets for grassroots appeals was limited and competitively allocated. In 1990, the Waihe‘e camp frankly was looking for a landslide. It was a revelation to listen to the proposals from various Filipino leaders on what needed to be done, all involving substantial sums of money. Joshua Agsalud skillfully had the various ideas catalogued—eventually by Fred at his law firm—and people assigned to follow up, and often to control overly enthusiastic efforts that would have busted the limited budgets available. In the end, except for the Akaka-Saiki Senate race, the 1990 races were never really in suspense. John Waihe‘e won a second term decisively. Patsy Mink and Neil Abercrombie returned to Congress. Akaka trailed in the polls until the final weeks of the Senate campaign. But the various factions in the usually fractious Democratic party rallied behind the well-liked Akaka’s campaign and Saiki squandered her substantial lead. Ben Cayetano began planning for 1994, still not the favorite to succeed John Waihe‘e. NEXT: The 1994 Maui Campaign for Governor.